[Jesus said,] "Now my soul is deeply troubled. Should I pray, 'Father, save me from this hour'? But this is the very reason I came! Father, bring glory to your name." Then a voice spoke from heaven, saying, "I have already brought glory to my name, and I will do so again." When the crowd heard the voice, some thought it was thunder, while others declared an angel had spoken to him. Then Jesus told them, "The voice was for your benefit, not mine." Wouldn't it be nice to be so sure you are living in God's will that you wouldn't need reassurance that you are doing the right thing? I don't know about you, but I have a hard time not envying Jesus' assurance expressed in this passage. 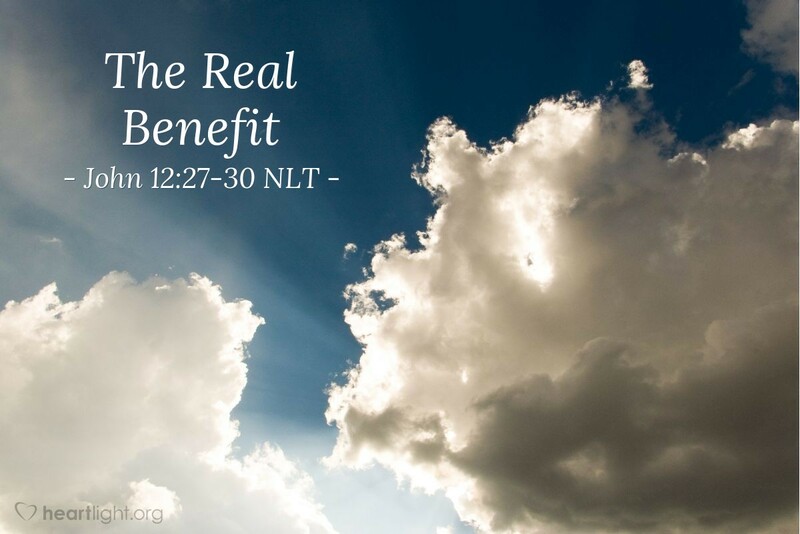 While we may never have the confidence of walking in God's will that Jesus had, we do have several incredible blessings that should give us great confidence about living in God's will. We can pray for wisdom and be assured we will receive it. We can take confidence that God is going to work in our lives for our good. We can trust that the Holy Spirit will help lead and guide us in God's will. God gave us this Spirit as a seal and a deposit guaranteeing our salvation (Ephesians 1:13-14). Due to our human limitations, we may not be as sure as Jesus was, but we need to rest assured that God will get us where we need to be to honor him if we are genuinely seeking his will and if our love for him leads us to be willing to do what he asks of us. O God Almighty, God of Abraham and Isaac and Jacob, please give me the wisdom to know your will, courage to follow it, and grace to do it in a way that blesses others. In Jesus' name, I pray. Amen.